Hah, I love that not catching an exception reboots the device 🙂 Thanks for this Sam. Very interesting. How are you starting the AccountAuthenticatorService service? I’ve not been able to figure this out in your code so far. Thanks. 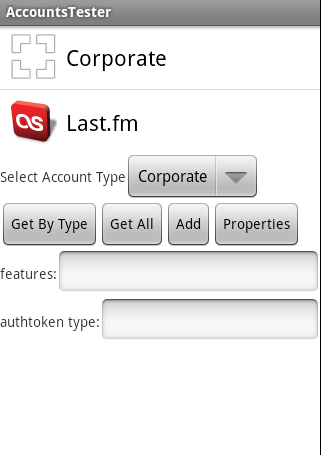 The Android system automatically starts the service when the user adds an account from the Accounts & Sync settings screen. I’m facing a problem with adding an account since the past few days. W/AccountManagerService( 53): caller uid 10044 is different than the authenticator’s uid. After this, nothing happens and I don’t see my account in the list under “Accounts & Sync”. Any idea why this could be happening? Do I have to give it a real user name and session key? Also what’s up with the caller UID warning? Any input would be appreciated. Thanks. Well, I was using it from my addAccount function. Still I changed AbstractAccountAuthenticator.addAccount() it to the below to use addAccountExplicitly(). Still no luck though, getting the same message on logcat. Yes. But I’m guessing its got something to with my not using the correct context to call the service from. Thanks for the code and explanation. 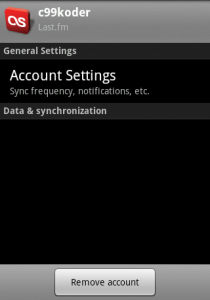 However, when I click on Add Account in “Accounts & Sync” it takes me to the default Exchange screen. My service isnt getting fired at all. I don’t see Account Authenticator intent being raised either. @Hmm if your account doesn’t appear in the Accounts & Sync add screen, then you haven’t defined it properly in the various xml files, including your android manifest. Thanks very much for a great post. One question. 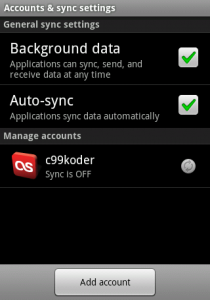 I’ve installed the AndroidSyncProviderDemo in the emulator and configured the account “efudd” now shows up on my “Account and sync Settings” settings page. However, I was expecting that when I create a new contact that it would either default to the new sync provider or prompt me for a choice. How can I make efudd|org.c99.SyncProviderDemo.account the account for all new contacts? android:proc=”:auth” is set in AndroidManifest (and can be seen in logcat when the service starts up). What could be causing this? That usually means that you are passing in the wrong context when you’re calling AccountManager.get(this).addAccountExplicitly. You need to make sure that you’re using the same context every time you call AccountManaget.get(). This is to prevent other things from messing with accounts your service has created. I’ve apparently done something to break it even more, since then — now it doesn’t even launch my Login activity. Gets up to the return value of onBind(), after instantiating the AccountAuthenticatorImpl, then appears to do nothing with that IBinder. Doesn’t call AccountAuthenticatorImpl.addAccount(), which is what returns the Login activity’s Intent. It appears as though Google has finally put up a fully-coded and working sample. One question about the account management on Android. Now that we can add facebook account to the platform, is it possible to share the account across multiple facebook clients in the platform? I can login once, and update my facebook status in several applications if necessary. how to do that? Can I ask when will the override function onbind be called? I have my own code, but it cannot be called unless I use context.startService or context.bindService. Thanks!! make sure the packagename is correct, especially if you rename the package and use all lowercase, the XML should also have all lowercase. At least that was what tripped me. It may be wrong place to log my query, but its urgent. can anyone please help me how to delete google account from “accounts and sync”. whereas onServiceChanged() method is defined in AccountManagerService.java. this piece of code is not doing anything i feel exception is bieng thrown which is handled at lower layer. Please help if anyone is aware how to call this function or how to delete account. I had same problems but when I added for the activity the problem is solved. I doubt whether their sample works for my emulator. in my previuos post, came to know we cant use AccountManagerService. Therefore using account manager. i need help to delete accounts which are displayed in “account and sync” from my app. but i’m getting accounts = 0 i.e. no accounts. whereas accounts exist. It would be great help if u can suggest something to resolve my problem. If you get the UID doesn’t match error, check the AUTH_TOKEN you set in the app vs the one you have in your account-authenticator xml file, they need to match. 09-15 16:38:57.191: ERROR/AndroidRuntime(30057): android.util.AndroidRuntimeException: Calling startActivity() from outside of an Activity context requires the FLAG_ACTIVITY_NEW_TASK flag. Is this really what you want? Seems that its impossible to post a xml file. Anyone know what is the importance of account type? It seams like any name will do (e.g: abc.account , cde.abc.google, etc) as long as I change the same field in “sync_contacts.xml” and “authenticator.xml”. However, only “com.google” would result in UID error. @Sean that field is what uniquely identifies your specific account type. You should choose an identifier that’s unique to your application. I can’t create account with “com.google” account type. Any ideas ? @Sean com.google belongs to Google. Use a different domain. I also encountered the alike error message, “W/AccountManagerService( 52): caller uid 10026 is different than the authenticator’s uid”. And I replaced the substring “org.c99” in “org.c99.SyncProviderDemo” as the path of my project. Then everything is ok.
1) Can we use syncAdapter to get data of a row of raw_contact table if that row has been affected (i.e added/deleted/edited). I know ContentObserver notify whenever raw_content table changes in onChange() method but we dont know which row has been changed ( to put this in another way if we add how would we know and if deleted we still get it through deleted flag in raw_contact table but how about edited one??). 2) when we get notification in ContentObserver can we fire requestSync (Account account, String authority, Bundle extras) to start Sync ?? how we can get data of raw_contact affected by contact application using these to parameters . I found the same error as @David’s. Activity context requires the FLAG_ACTIVITY_NEW_TASK flag. Is this really what you want? Can anyone help to solve the issue? Sam Steele, I’m even can’t even express in words how grateful to you! This topic is very difficult, and no one explain everythih so clear as you! THANKS. how to turn auto sycn on ?